Panamá (820,000 inh. ; 1.2 million in metropolitan area) is the capital of the Republic of Panamá. North-south line (15.8 km, 14 stations); 7.2 km underground through city centre, section through northern part of the city is elevated. 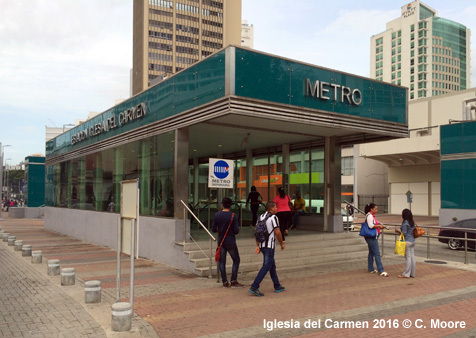 Partial service operated during 'Jornada Mundial de la Juventud' from 18 to 28 Jan 2019, serving five stations: San Miguelito, Cincuentenario, San Antonio, Pedregal and Corredor Sur. 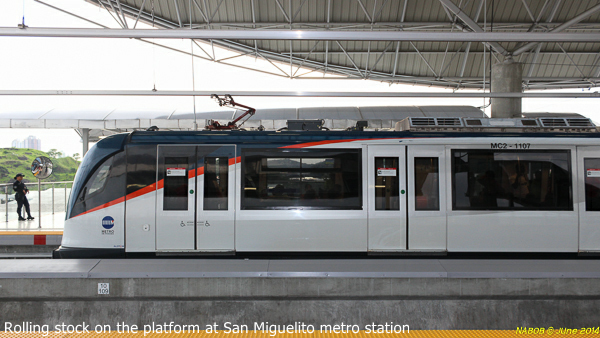 Line 2: in a later stage it will be extended southwest from San Miguelito, then intersect with L1 at Iglesia del Carmen before continuing east along Calle 50 to Multiplaza. 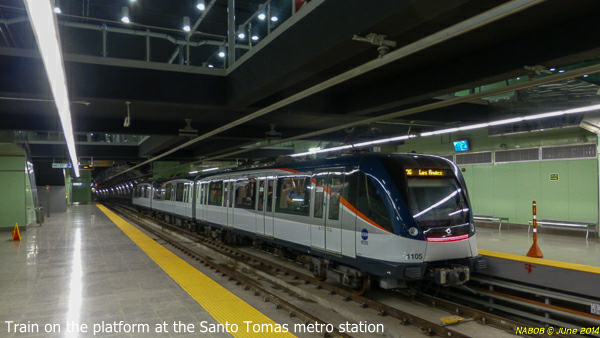 The Metro de Panamá is the only Metro in Central America (they exclude Mexico from this geographic reference), its single route covering the traditional city centre in the west and the suburbs to the north-east area of San Miguelito and beyond. 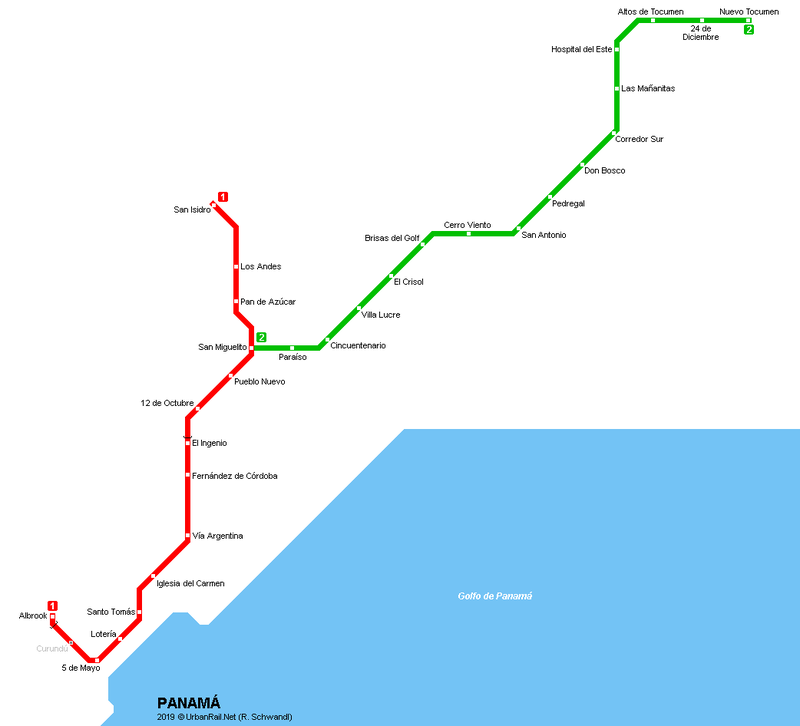 The line is 15.8km in length and the journey takes 26mins. The line runs on overhead power supply and uses standard gauge. 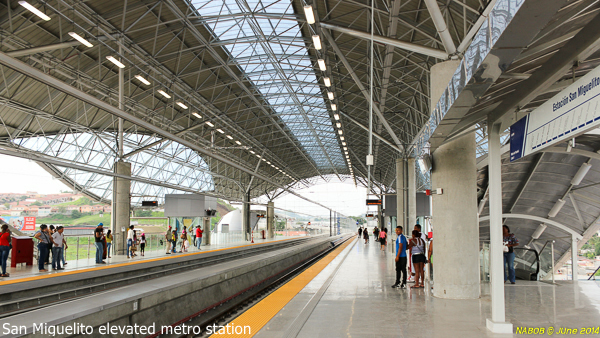 This section runs from Albrook in an open cut for 0.2km and then goes underground for 7.7km (7 stations): The western terminus of the line is Albrook station, located next to the main bus terminus and a large shopping centre. This is also the nearest station to the Canal and is located in an open cut (classified as grade). The station is roofed and accessed by walkway from the shopping and bus facilities. Given its location this is a very busy station. 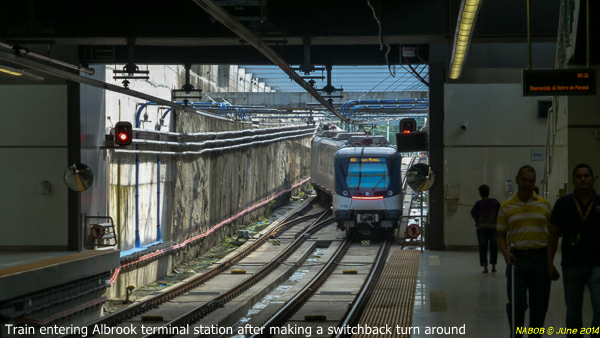 Here, terminating trains head 400m further into the cutting (beyond which the sheds are located) from where they switch to the outbound track after a 2min turnaround. 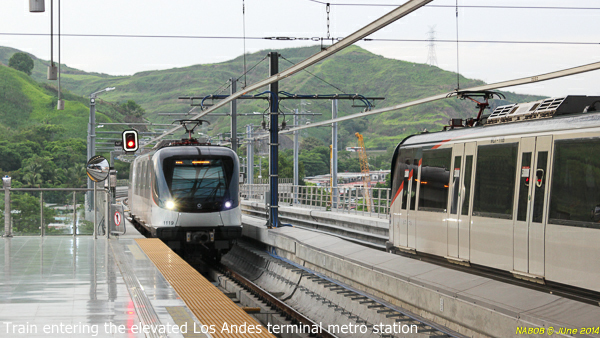 On the outbound journey, 200m after leaving Albrook the train heads underground at quite a slow speed before a sharp left turn to 5 de May Station. 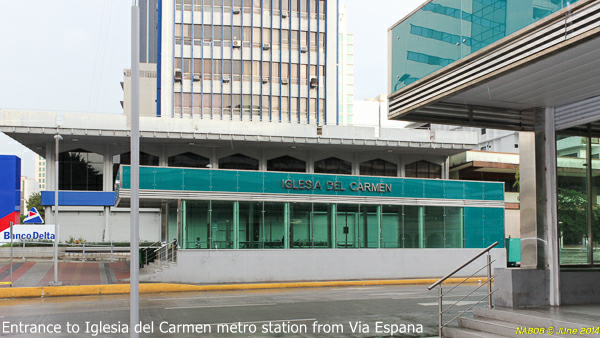 This station, along with Carmen, are the busiest underground stations. 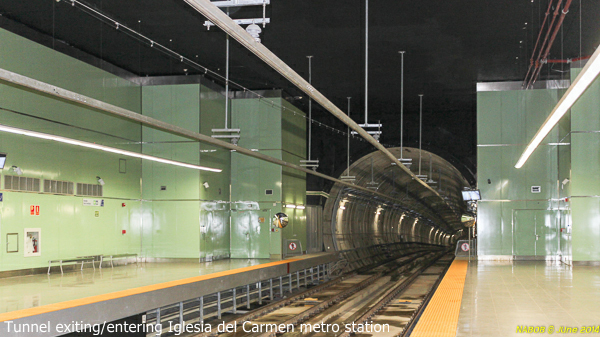 The train continues its route at a slow pace (40kph) through a wide, well lit tunnel, calling at 7 underground stations. These are all similar in form. After Via Argentina there is a sharp acceleration to 60kph. 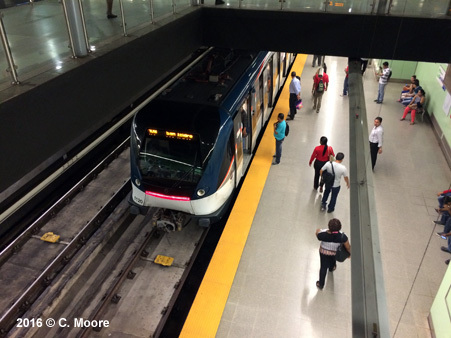 This part of the line covers the original city centre and newer middle class/shopping areas around Campo Alegre. 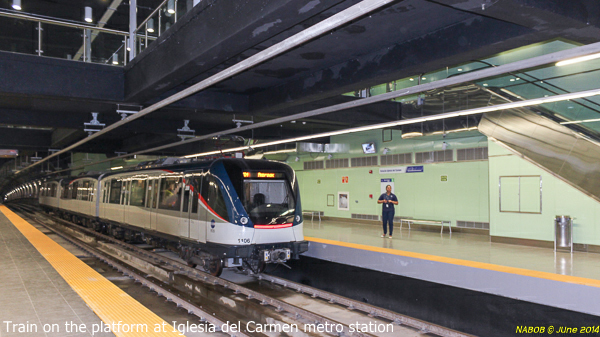 Carmen and Argentina are the stations which are considered to be located in safe areas. The underground stations are pleasant and functional. 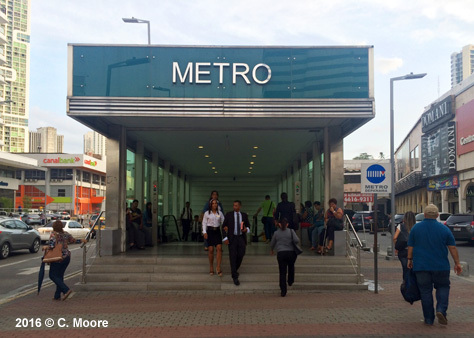 At the street level entrance, stairs are housed under smart dark-green and glass paneled entrances, embossed with large silver protruding letters offering the station name. There is also a derisory totem, consisting of a large disc with logo atop a rusting pole. 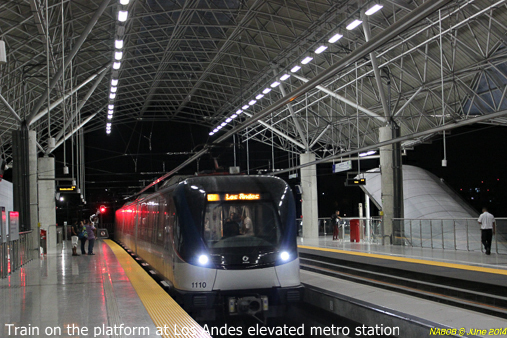 Nonetheless, the stations present a smart and high quality image in otherwise chaotic streetscapes. The ticket halls are sizeable and clean with an information office (no hard copy information) and 3 or 4 ticket machines at each entrance. These machines are very basic and difficult to use. The system requires you to purchase a rechargeable card ($3) and then add credit through the machines (minimum $1). Cards are then scanned/tapped on entry and exit, with each journey being charged a flat fare of $0.35. 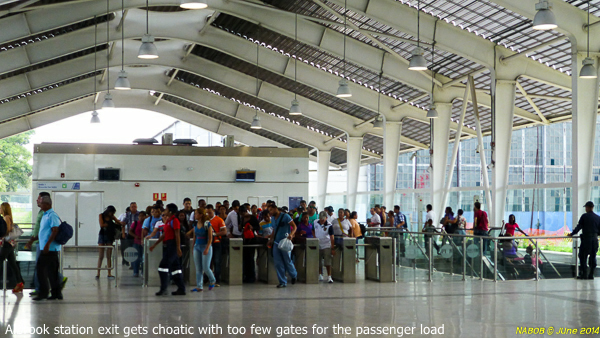 I witnessed constant queues at the machines, as I did at the ticket barriers. At the main stations, the Metro simply spews out too many passengers for the barriers to handle and there are regular queues which hardly end before the next train arrives. 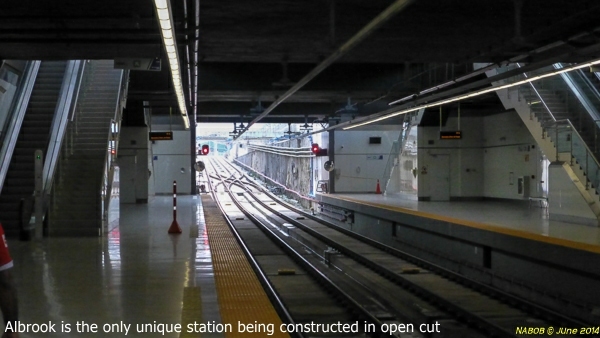 Escalators, stairs and a central lift lead to the mezzanine and platform levels. The stations have good directional signage easing navigation to the platforms (all side platforms).These platforms are built for 5 car sets and so passengers bunch at one end where the three car sets stop. At the platform level the station interior walls are clad in large pale green panels which are bereft of advertising and look quite stark. There are perfunctory schematic maps, a station location map, a basic strip map with current station shown as a red dot, and direction sign. This takes precedence over the sign for the actual station name which is small and inconspicuously placed. Next train indicators show the next 2 trains with their 4min headway. There is no timetable information or first/last train times (0500-2200) but timetables are not really required for such an intense service level. This is certainly a ‘turn up and go’ system - passengers hang around the platforms for the next train if they can’t face the crush and there is no running if there is a train on the platform – a quite leisurely and healthy approach. As the tunnel was bored at a 10m diameter to house both tracks, the views down the well-lit tunnel and across the wide platforms gives a very bright and spacious feel to the platform areas. Indeed, the width and lighting of the tunnels afford great views of the trains arriving and departing for some considerable distance. On leaving El Ingineo, the outbound service takes a very gradual incline to reach 12 de Octubre. Here the line lies above the main congested arteries heading to the north-east of the city. The infrastructure twists and undulates quite a bit and the speed of the train is generally around 60kph on this section, although it reaches 75kph at some points. This part of the city is most definitely home of the local population, with dense, low-rise dwellings clinging to the hillsides, basic shopping areas and occasional industry. To the north lie the mountains of the interior and they provide a wonderful backdrop to the urban views you get from the elevated section. 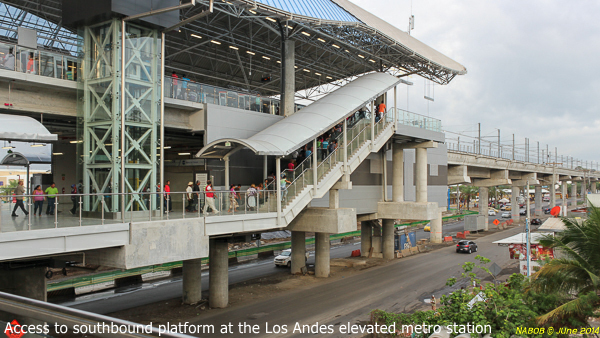 Los Andes, San Miguelito and San Isidro stations offer interchange with rapid buses and these are busy stations. 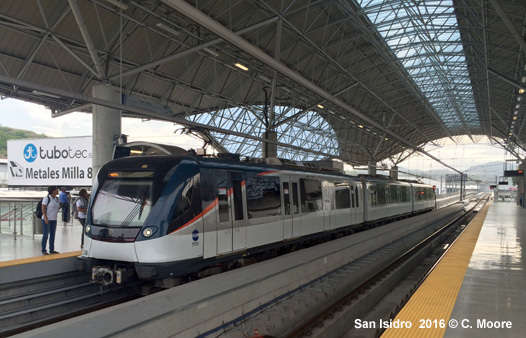 At San Isidro the terminating train once again moves forward 300m on the elevated section to the next switch where it changes to the inbound track – a 2 min turnaround again. 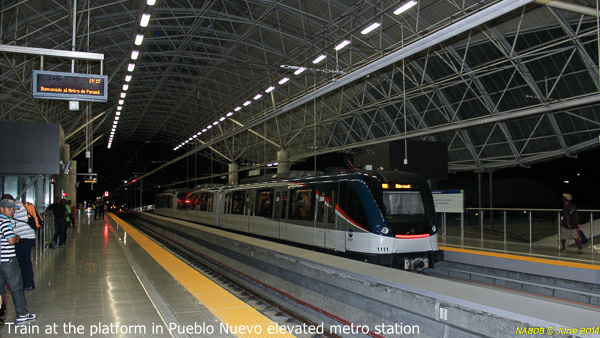 The elevated stations are all similar and are very large. 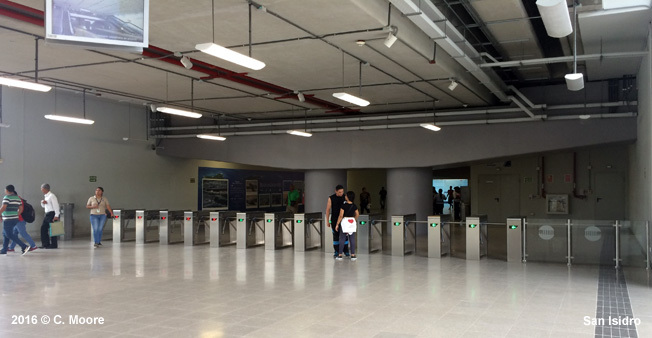 Access from the roadside is by covered walkways to the large mezzanine ticket hall from which there are stairs, escalator and lift access to the side platforms. 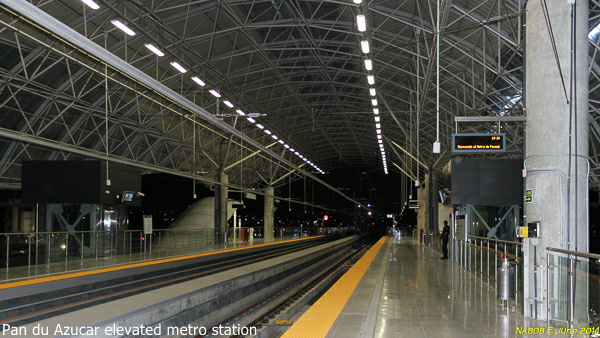 Again, the stations have been designed well and are very spacious and airy with a ‘pringle’ shaped corrugated roof. The platforms are wide, have the same platform information and are again built for 5 car sets. 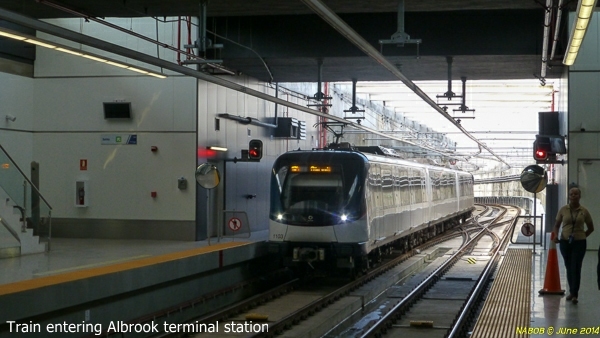 The Alstom Metropolis 3-car sets are smart, with a predominantly blue frontage, a red upward flash at the side of the train and a grey band along the windows. 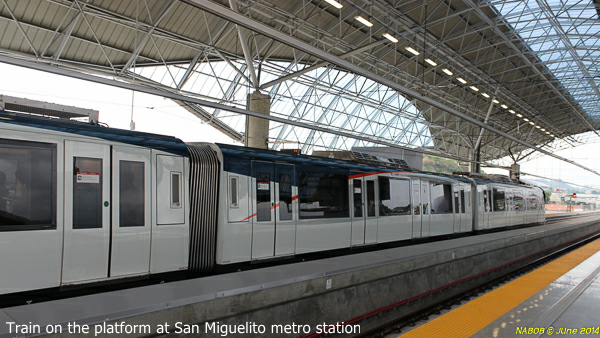 The base of the train is white and the logo is located on the side at the front of the train. 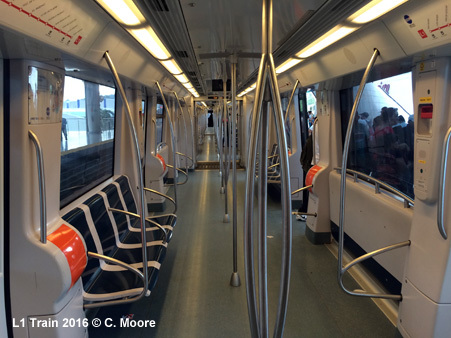 The carriages have a white interior and are clean and free from advertising. They have side seating in the form of 3 sets of 4 blue plastic bucket seats. These are located at alternate sides of the carriage. Having only 12 seats per carriage leaves more room for standing (200 capacity per carriage), and this is a sensible approach as the trains are always very busy. The carriages have no schematic but there is a red strip map above each of the 6 doors which shows the yet unopened station of Curundu. The doors have a push button activation which I found strange for such a well used system. TV screens show ‘behavioural’ information and there is additional electronic and audio provision in Spanish for the next station. There is also a regular announcement to inform passengers to be aware of personal safety. The stations/trains are well policed and I never felt threatened at all. One of the highlights is the view of the drivers cab and beyond through tinted glass, making the line, the views through the hills of the north-east, and the wide tunnels of the underground section all the more interesting. Although I wasn't expecting too much, this is a very effective and efficient system. Trains stop at stations for about 15 seconds, passengers board and alight very efficiently, and with trains every four minutes, a clean environment and good station organisation, this is not a bad little system.